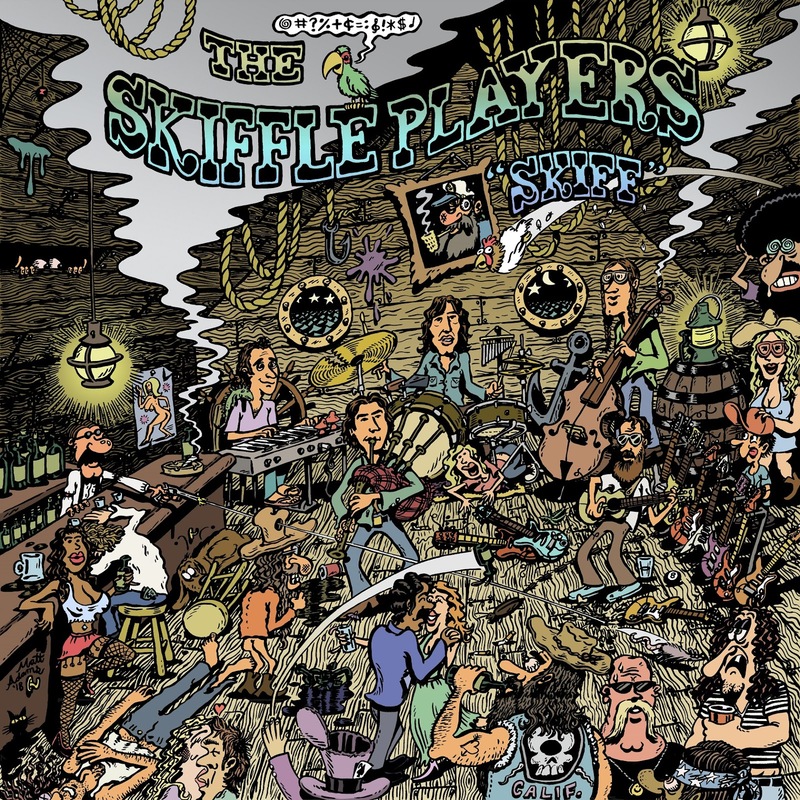 Spiritual Pajamas is honored to announce the new LP from The Skiffle Players. 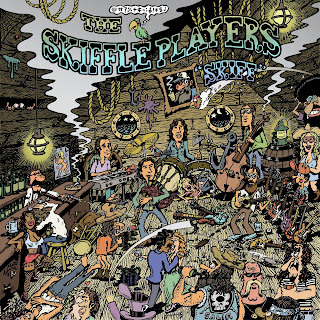 Their second LP, “SKIFF” is a new direction for The Skiffle Players. Now, they all sing and write. There is NO LEADER. Recorded at Infinitespin Recorders in Van Nuys CA, with engineer Matt “Linny” Linesch, SKIFF begins with a bold opening; the Farmer Dave penned ‘Cara’, heavy information for the soul. Then, into classic Cass insanity on ‘Local Boy’, a wild ride on the run from the cops. Third is a touching tribute to a bygone companion, ‘Miss It When It’s Gone’, written and led by Neal. SKIFF’s revolving perspective continues to bounce around, leaving no apparent land to stand upon. In that, it is deeply subversive. For there is nothing to defend, but the ability to transform and imagine. The album continues to unfold back to Cass with a satire on justice, ‘The Law Offices of Dewey, Cheatum and Howe’. From the saloon ‘Long Horns, Long Necks, Long Legs’, to the rainforest ‘Herbamera’. Neal blasts in again with the sun-bleached rambler, ‘Los Angeles Alleyway’. Farmer Dave’s ‘Skiffleman’ “sings a song for everyone”. Cass plays with memory in a song about coming of age in the Bay Area on ‘Oakland Scottish Rite Temple Waltz’. Penultimately, ‘Santa Fe’, an elliptical broadside about materialism and waste. SKIFF concludes by pushing off again, out into the familiar waters of a traditional skiffle number, ‘Sweet Georgia Brown’, each member taking a perhaps all-too casual solo. This is acoustic dance music at its finest. It is also refreshingly contradictory. Irreverent and mystical. Deeply personal and communal. Traditional and profane. The ever revolving and disintegrating ship known as SKIFF. STORY OF THE SKIFFLE PLAYERS. Once upon a time, Mollusk Surf shop asked Farmer Dave Scher to put together a band for a concert in Big Sur. Thus the Skiffle Players were born, selected from friends of both Californias - Northern (Cass, Dan) and Southern (Dave and Aaron) plus a New Jersey transplant to Ventura County (Neal) - each meeting at the metaphorical heart of the state, the mythical SUR. The origin concept of the band was to create a new folk fabric from the ashes of tradition - whatever the ashes of tradition means to you. A matter of debate. Although The Skiffle Players approach the definition as, broadly, ‘street music’. Busking. Singing for one’s supper. Entertaining the passers-by. Make em dance all the way home. The term may have its origin in Memphis jug band music of the 20s. It seems to have emigrated to England with the US soldiers during WW2, and was taken up by a new generation, beginning with Lonnie Donegan, ending with The Quarrymen aka The Beatles. The term then somewhat disappeared. SO, THEN, WHAT IS WEST COAST SKIFFLE? The Skiffle Players are the very ash to explore that question. From the beginning, no rules. No song off-limits. Everybody sings. No idea is silly enough, for sometimes the absurd is the very device for a cataclysmic rift in the fabric of sound. Of course, it can also end in hilarious catastrophe, and often does - a necessary, cosmic comedic consequence to this fearless approach. Like Kurt Vonnegut and Bo Diddley sharing a surfboard, something interesting is going to happen. Check out each of these musicians’ history. It is vast. From Beachwood Sparks to Cass McCombs’ ten solo albums to Circles Around The Sun, The Skiffle Players are the sum of these adventures.